It is possible to choose a folder, and whenever a file in this folder or any subfolder is edited in a program, the app assigns the time spent with editing this file to a specific job. That is very useful. Unfortunately that does not work with Affinity Software. The document path is not recognizable through the Accessibility-API. Would be great if this could be implemented in the future. Could this be due to the way that Affiniy apps are sandboxed on a Mac? this is still very important to me. Any news on this? Then I wonder why they list APh as being supported on their website? The Affinity applications may be sandboxed, or not, on Mac, depending on where they were purchased. They're sandboxed if purchased from the Mac Store, and not sandboxed if purchased directly from Serif (which has been possible since sometime last Fall, I think, though I don't know the exact date). I would hope, though, that the Timing apps website would make that clear, if it's an issue. @wolfgangkampfgarten1956: I think you should also be talking to the Timing people about this, not just the Serif people. Affinity Photo is supported by Timing, but not completely. Timing does recognize when Affinity Photo is used and also knows the filename, but it does not know in which folder this file is. As you can see, for Photoshop is also the file path shown. 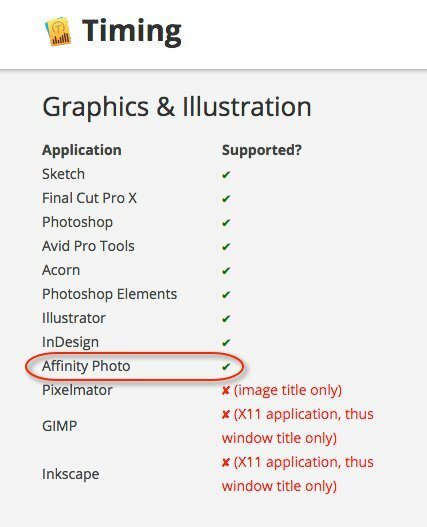 I already contacted the Timing developer, and he answered that Affinity Photo does not make the filepath accessible through the accessibility API. I tried both Affinity Photo versions, from Mac App Store and directly from Serif.